Ilya Romanov, August 2015. Source: Grani.ru.Ilya Romanov is 50 years old, and has been active in protest movements in Russia since the end of the 1980s. His war on the Russian authorities began in his native city of Gorky (now Nizhny Novgorod) when he was 13, secretly publishing and distributing leaflets denouncing the Communist regime. After being expelled from university in his hometown, he joined the Confederation of Anarcho-Syndicalists, producing local newspapers at the height of perestroika in the late 1980s – before becoming involved in social and ecological protests in Russia during the 1990s. But Romanov has spent most of the last two decades behind bars. He is relatively unknown to the latest generation of Russian anarchists – and the wider world. 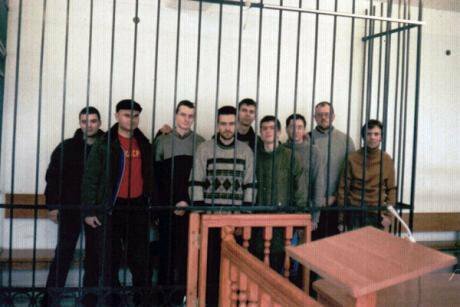 After being sentenced to nine years on terrorism charges in Nizhny Novgorod in 2015, he is now facing a new charge of fomenting terrorist activity while serving his sentence in Mordovia. According to investigators, while in prison hospital Romanov posted an “Islamist video” to Facebook in summer 2017. Romanov claims that he is not in any way religious and that this was a provocation on the part of the Russian security services. This new case against Romanov has now been transferred to the courts. Looking at Romanov’s life, we can see how the reaction of the Russian law enforcement to resistance has changed over time: while in the early 1990s, anarchists could seize regional administration buildings and still remain at liberty, now they face criminal charges for their Facebook posts. Larisa recalls how Ilya once, on a train, gave his jacket to a homeless person who was bemoaning his life. Ilya and Larisa were together between 1996 and 1998 and have a child together. Larisa now has a new family, but hasn’t divorced Romanova in order to help him in prison. After leaving school, Romanov began a degree at Nizhny Novgorod’s medical institute, but left after three years when he had qualified as a paramedic. He was thrown out for a protest action where he hung a barbed wire wreath on the local KGB building. At this time he was also a member of the “Democratic Union” organisation, which brought together people with various opposition views, including left wingers. “There’s a photo of him walking along a street with Valeriya Novodvorskaya,” Larisa recalls, referring to the organisation’s prominent leader. Ilya Romanov with Valeria Novodvorskaya, Soviet dissident, leader of Democratic Union and later prominent Russian liberal commentator. Source: Larisa Romanova. In the 1980s, Romanov was also interested in Maoism, but then he started hanging out with anarchists. Moscow anarchist philosopher Pyotr Ryabov recalls how he met Romanov when the latter was already leading the Gorky section of the Confederation of Anarcho-Syndicalists. Romanov also helped publish the “Obshchina” (“Community”) nationwide anarchist newspaper and produced an edition of his own paper, “Solntse” (Sun) and several editions of the “Chastnoye Litso” [Private Citizen] journal. Another member of the Confederation at the time was Andrey Isayev, who later abandoned his left wing views in the 1990s and is now an influential United Russia MP. Larisa has also had direct experience of losing her freedom. In the late 1990s, she was given a four years suspended sentence for an assassination attempt on Nikolay Kondratenko, the then governor of the Krasnodar Krai who was famous for his ultra-right and anti-Semitic views. Larisa then spent five and a half years behind bars for involvement in the case of the “New Revolutionary Alternative”, which was allegedly responsible for two small explosions in the reception area of the FSB building in Moscow and the blowing up of a monument to Tsar Nicholas II in the Moscow region. 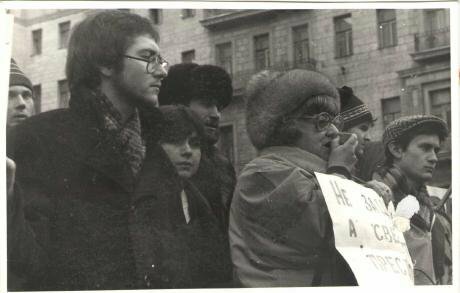 On her release, Larisa worked for Andrey Babushkin’s “Committee for Civil Rights”. She has four children. Russia’s Anarcho-Syndicalist movement split up pretty quickly and Romanov later claimed that the Confederation was created by the KGB to manipulate the protest movement. He wrote a long article on the subject in his own “Grass and Freedom” newspaper. Ryabov considers this to be a conspiracy theory. 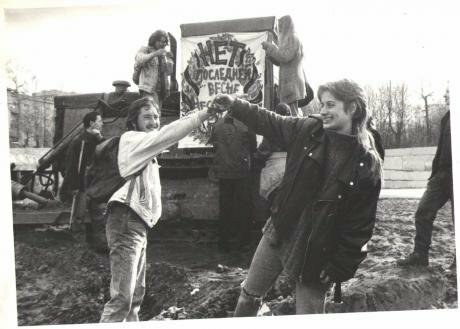 In the 1990s, Russian anarchists were very active in social and environmental movements and protests against the war in Chechnya, and Romanov made his presence felt on both fronts. Anarchist Anna Pavlova remembers first meeting him in 1994, when he was an organiser of anti-war actions – they sprayed graffiti on recruitment centres together. When the special forces team arrested the “invaders” of the Lipetsk administration building, a legend popular among Russian anarchists was born. It told of a certain “Slepukha”, the “anarchist-in-chief”, who was never caught at an action but who organised environmental protests. The factory in Lipetsk was never built. “When some Moscow State University student was recently hauled up for scrawling ‘No to the fanzone’ on a bollard, I remembered how in the early 1990s you could seize an entire administration building and just get locked up in a police cell till the evening,” muses Ryabov nostalgically. The radical battle for the environment didn’t stop at Lipetsk: Romanov decided to campaign on behalf of ancient forests in Russia’s North Caucasus. In 1996, Romanov was living in Moscow, in a squat on the Ostozhenka, a street now lined with expensive real estate. Hippies lived in one flat in the squat, anarchists in another, and the third was occupied by Paul Spengler, an American famous for his attempts to protect Moscow’s historic buildings from the bulldozers. In Moscow, Ilya took part in protests to preserve the Neskuchny Sad, when anarchists, locals and Tolkien enthusiasts succeeded in saving this park in the very centre of Moscow from destruction. According to Ryabov, Romanov was friendly not only with other anarchists, but also with Trotskyites. In 1993, he sold the Trotskyite “Workers’ Democracy” newspaper on Red Square. One day, he was attacked by “Barkashovites” (followers of Aleksandr Barkashov, the founder and leader of the "Russian National Unity" movement), who grabbed his papers and broke two of his ribs. 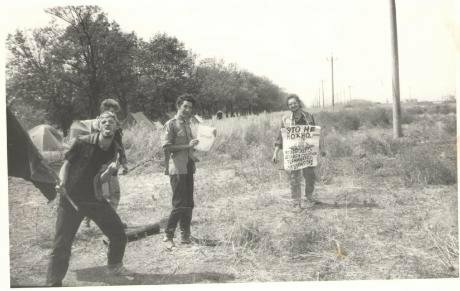 In return, a group of anarchists and Trotskyites attacked the Barkashovites in possibly the first ever anti-fascist street protest in Russian history. In the mid-1990s, Romanov’s first wife Lada converted from anarchism to conservative Orthodoxy and returned to her parents’ home in the Nizhny Novgorod region. A common attraction to anarchism and environmentalism brought him together with his second wife Larisa, with whom he began to publish the “Grass and Freedom” newspaper. The journal, with its radical articles and interesting illustrations, had a significant influence on anarchists at the time. “These days, it would lead to 100 criminal charges,” says Ryabov. Aleksandr Zimbovsky, an activist with the Trotskyite Workers’ Revolutionary Party, remembers Romanov being part of a medical team during the Russian constitutional crisis of October 1993 – an initiative of Muscovite left wing radicals who decided not to take sides in armed confrontations, but instead to act as stretcher bearers, getting wounded away from the White House government building. According to Zimbovsky, Romanov also took part in a second action in front of the White House, the miners’ camp protest of 1998. In protest against months of delays in receiving wages, miners set up a protest camp outside the government building for several months. Romanov found himself behind bars for the first time in the same year – for possession of a small amount of drugs. In those days, there was no risk of a long sentence, and according to Larissa, it was even unusual for a suspect to be remanded in custody on that charge. Evidently, the FSB hoped to tie him into a case against the anarchist “New Revolutionary Alternative” organisation, but couldn’t find enough evidence. 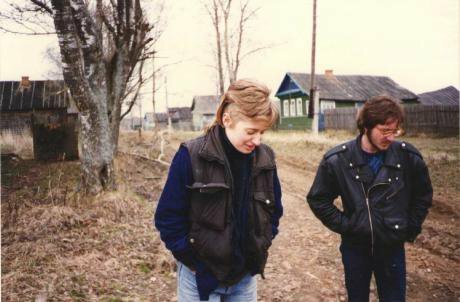 Larisa Romanova and Ilya Romanov at a commune in Tver oblast, 1996-1997. Source: Larisa Romanova.As a result, Romanov was amnestied on the drugs charge, but declared insane – on FSB orders, Larissa believes. He was sent back to his home city of Nizhny Novgorod for treatment, thanks to the intervention of his father, a well-known cardiologist. Romanov returned to Moscow in 2002, but it was clear that the FSB were still on his case. 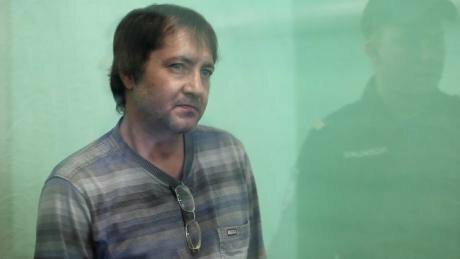 He was arrested and driven by car to Penza, a city 550 km south-east of the capital, where an acquaintance made a statement to the effect that he and Ilya had made improvised explosives together in the 1990s. On arrival in Penza, Romanov slit his wrists. There was no other evidence against him, and the man who had given the initial evidence against him was certified as insane, so they had to release Romanov. Romanov then left Russia for Ukraine, as anarchists there had promised to help him leave the the former Soviet Union in order to put him beyond the reach of the FSB. He didn’t actually meet up with them, but got involved in protests on Kyiv’s Maidan demanding the resignation of the then President Leonid Kuchma, where he met communists from Odesa and other Ukrainian cities. In December 2002, he was arrested again, this time in connection with the so-called “Odesa Komsomol Case”. This case involved 11 citizens of Russia, Moldova and Ukraine being accused of setting up a so-called “Black Sea Soviet Republic”, as well as possession of arms, robbery with violence and other criminal offences. The arrestees were subjected to horrific torture, and one suspect died under torture during the investigation. 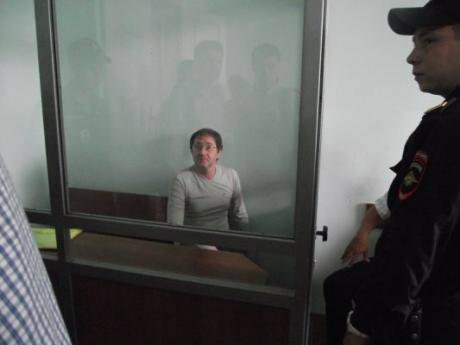 Romanov was given a 10 year prison sentence for carrying out an explosion in Kyiv, next to Ukraine’s Security Services (SBU) headquarters. Anarchist Anna Pavlova recalls how Romanov fought for the rights of his fellow prisoners during his time in Ukrainian prison, and succeeded in having the prison governor removed from his post. Romanov was eventually released in 2012. Two years later, the “Black Sea Soviet Republic” would become part of the mythology behind the so-called “People’s Republics” in eastern Ukraine, as “the first attempt to create the state of Novorossiya”. Andrey Yakovenko, another defendant in the “Odesa Komsomol Case”, succeeded in being sent to a colony inside the separatist-controlled area, where he was released “with honour”. In 2014, Romanov was more inclined to support the Maidan protests than the Donbas separatists. Indeed, Romanov’s freedom was quickly cut short. In late October 2013, a homemade firework went off while he was holding it, and one of his hands had to be amputated in hospital. This provided the cops with an excuse to re-arrest him on a charge of terrorism. Romanov claims that the local anti-extremism police hacked into his computer and posted several files, including a text file that included the following statement: “Shantsev, Sorokin, Kondrashov (leading Nizhny Novogorod officials): if you don’t stop destroying our parks I’ll blow you all the **** up.” A second file was entitled: “Aryan Terror: a guideline for training white terrorists”. These became the basis for a charge of planning a terrorist act, for which Romanov is now serving a nine-year sentence. Ilya Romanov, August 2015. Source: OVD-Info. Then, in summer 2017, Romanov was faced with yet another charge – for posting an Islamist video with Hebrew subtitles on Facebook. The implication was that Romanov supported Islamic terrorism. The case materials have been handed over to the courts. Romanov claims that he doesn’t know how to transfer files from his mobile phone to the internet, that he has no connection with Islam and that he is the victim of a local FSB operation. Judging from the case materials, law enforcement fabricated a medical diagnosis that allowed him to be transferred from prison colony to a prison hospital, which is easier to bug. There he shared a ward with another prisoner, who cooperates with the security services. This prisoner gave Romanov a phone which he could use to access the internet (prisoners are forbidden to use mobile phones) and set up an account for him on Facebook. In the more comfortable conditions of the hospital, Romanov began to enjoy himself: he carried out Buddhist rites for the death of Vladimir Putin and posted caricatures of the Russian president with male and female sexual organs on his Facebook page. FSB officers eavesdropped on his ward for several months without doing anything more, but then posted a Jihadist video on the Facebook page they had set up for him and initiated a new criminal case against him. Anna Pavlova notes that no human rights organisations are supporting Romanov, despite evidence of police abuse of power and the practice of “adding sentences”. Romanov is little known even amongst those who embraced anarchism in Russia in the 2010s, although he was among the founders of today’s anarchist movement. This is probably because of his radical convictions, which don’t chime with high profile rights campaigns. Romanov’s activist experience goes back to the pre-Putin era, when you could scuffle with far-right agitators on Red Square or seize a regional administration building and hoist a black flag above it with impunity. He has not yet been able to take part in today’s Russian protest movement, but his attitude to the Russian authorities is understandable: he comes from an era when there was incomparably more freedom in Russia.